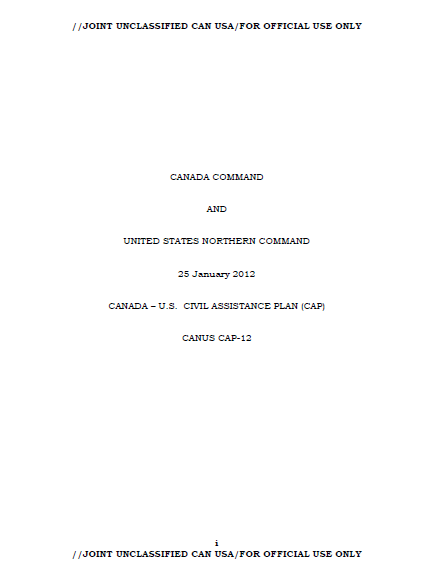 The following is the most recent version of the U.S.-Canada Civil Assistance Plan signed in January 2012. The original ten-page agreement, signed in 2008, was released via the Freedom of Information Act that same year. However, the document’s appendices were not released due to their “pre-decisional” status. The 2012 version of the plan available below includes all appendices. 1. This bilateral plan provides a framework for military forces of one nation to support military forces of the other nation that are providing military support of civil authorities. 2. The focus of this document is the unique, bilateral military planning considerations required to align our respective national military plans to respond quickly to national requests for military support of civil authorities. Nothing in this plan prevents either nation from responding unilaterally; rather, this plan will facilitate unity of effort, if and when requests for bilateral support are received. a. General. The purpose of the Canada-United States Civil Assistance Plan (CAP) is to provide a framework for the military of one nation to provide support to the military of the other nation while in the performance of civil support operations to the primary agency (e.g., floods, forest fires, hurricanes, earthquakes, and effects of a terrorist attack). (1) Should resources be identified outside the capabilities of each nations’ military, requests for civilian agency support would require Government of Canada (GoC) or U.S. Government (USG) approval. Support covered under this plan will only be provided when agreed to by appropriate authorities in both the GoC and the USG. When approved, military forces from one nation augment the other nation’s forces in civil support operations. (2) Military support under this plan is not provided directly to law enforcement agencies, but rather to the other nation’s military. Support to law enforcement operations will only be considered as part of military-to-military support to civil support operations; typically, restricted to logistical and other means of indirect assistance unless coordinated and approved by both nations’ governments prior to mission execution. One nation’s military will never be directly in support of the other nation’s law enforcement agencies. GoC and USG approval will clearly delineate command relationships to ensure any military support to a nation’s law enforcement operations is under the control of that nation’s military commander. (3) Guidance and direction to develop this plan is derived from Ref 1f. This bilateral plan may be used alone, or concurrent with the Canada-U.S. Combined Defense Plan or other national, bi-national or bi-lateral plans. The Commander, Canada COM and CDRUSNORTHCOM are the designated planning agents for the development of this plan. b. Federal Coordination of Emergency Response. The Canadian Department of Foreign Affairs and International Trade (DFAIT), acting on behalf of the GoC, and the U.S. Department of State (DOS), acting on behalf of the USG, will, upon receipt of a formal request for, or offer of mutual assistance, coordinate an agreed upon bilateral response with the appropriate government agency that may include military support. (1) Coordination of military support of civilian authorities will take into account existing government to government agreements, which may include the bi-national NORAD Agreement and/or regional State/Provincial agreements. The supported nation’s military will coordinate the provision of all military support to their civil authorities. (2) In the United States, coordination of foreign assistance for a disaster is conducted per the International Assistance System Concept of Operations. c. Area of Responsibility (AOR). The geographic AOR includes North America, the Gulf of Mexico, the Straits of Florida; the Caribbean region inclusive of the U.S. Virgin Islands, British Virgin Islands, Puerto Rico, the Bahamas, and Turks and Caicos Islands, including each nation’s territorial seas; and the maritime approaches to North America. d. Opposing Force. Opposing forces are not expected during the conduct of operations described in this plan. However, when planning and conducting operations where the military forces of one nation are supporting the military forces of the other nation while they conduct civil support operations, commanders should consider operational security (OPSEC) along with the following anti-terrorism/force protection (AT/FP) issues: (1) Terrorists organizations could conduct operations against the Canadian or U.S. force, or in the civil support operations area; (2) State/provincial and local police capabilities could be severely degraded in the area of operations, allowing a corresponding rise in criminal activity that could affect the Canadian or U.S. force; and (3) Environmental factors ranging from weather to contamination and disease could significantly affect the Canadian or U.S. forces. (a) The Department of Foreign Affairs and International Trade (DFAIT). DFAIT is responsible on behalf of the GoC for facilitating requests for international assistance. (b) Public Safety Canada (PS). The Minister of Public Safety is assigned primary responsibility within the GoC to coordinate the federal response in crisis and consequence management situations within Canada. (c) Department of National Defence (DND) / Canadian Forces (CF). The CF may, upon request, provide support to PS, other federal departments and agencies, provincial/territorial and municipal authorities pursuant to the National Defence Act (NDA), or other legal authority. Commander, Canada COM is the responsible CF operational commander within the Canada COM AOR defined as Canada, the contiguous United States, Alaska, Mexico, and the maritime approaches to North America. (a) Department of State (DOS). The Department of State is responsible for coordinating with other nations for disaster assistance, including military assistance. (Ref 3l). (b) Department of Homeland Security (DHS). The Secretary of DHS is the principal federal official (PFO) responsible for U.S. domestic incident management. As a component of DHS, the Federal Emergency Management Agency (FEMA) is responsible for leading and supporting a risk-based, comprehensive emergency management system of preparedness, protection, response, recovery and mitigation to reduce the loss of life and property and protect the U.S. from all hazards. (c) Department of Defense (DOD). In accordance with the National Response Framework (Ref 3k) DOD may, upon request, provide support to DHS and other federal agencies for domestic Defense Support of Civil Authorities (DSCA). Upon SecDef approval, CDRUSNORTHCOM is the supported combatant commander with responsibility to coordinate defense support to federal agencies within the portion of the United States that lies within CDRUSNORTHCOM’s AOR. (1) Requirements for military support of civilian authorities could be fulfilled by either nation’s military. However, the nation providing cross-border military support will not fulfill these requirements directly to the other nation’s civilian authorities, but rather to the other nation’s military who in turn supports that nation’s civil authorities. (2) Operations will typically occur in a permissive environment. j. Law enforcement and regulatory functions. (a) USNORTHCOM forces are generally prohibited from directly participating in the enforcement of U.S. law. Exceptions to this general rule and categories of permissible support to law enforcement are outlined in the references at paragraph 1.k(1) of this Appendix. The NORTHCOM SJA shall advise on any contemplated USNORTHCOM support to U.S. law enforcement. (a) The CF has no mandate to conduct civilian law enforcement activities but can assist law enforcement agencies. The CF support can never be greater than the authority of the requesting law enforcement groups to conduct law enforcement activities themselves (see references at paragraph 1.k(2)). (b) Peace Officer Status for CF. Peace Officers are public authorities responsible to maintain the public peace and enforce the law. CF personnel employed on an operation may have Peace Officer status if it would be appropriate for them to perform law enforcement duties but only when so employed, IAW QR&O 22.01. Peace Officer status ceases when CF personnel are no longer performing assistance to law enforcement duties. CF personnel with Peace Officer status have all the powers and protections of Peace Officers as set out in the Criminal Code and the special protection from civil and criminal liability enjoyed by Peace Officers. CF members without Peace Officer status have no more authority over the civilian population than they would otherwise have when performing their normal day-to-day duties. Specifically, CF personnel without Peace Officers status do not have the enhanced powers of arrest, detention, investigation, or traffic control enjoyed by Peace Officers. A legal advisor should be consulted to know whether CF personnel have peace officer status and when. (a) References at paragraph 1.n(1) apply to USNORTHCOM operations. The USNORTHCOM SJA shall provide legal review and oversight of intelligence activities as required. (b) Information and intelligence collection and sharing may be possible for domestic operations. Ops must be based on appropriate legal authority. Specific legal advice should be sought on a case-by-case basis for matters of this nature. In general, the CF may collect and share defence intelligence pursuant to the National Defence Act and the CF’s defence of Canada mandate, in accordance with existing intelligence programs and legal authorities. The collection, production, and dissemination of security intelligence shall be performed primarily by CFNCIU in accordance with Reference J. (a) While acting in support of a law enforcement agency for an operation, the CF is permitted to assist this agency in collecting information, pursuant to the mandate and lawful authority of that agency to do so. The law enforcement agency remains responsible to obtain any required judicial authorizations and to ensure that any CF assistance to act upon such authorizations is sought in strict accordance with the terms and limitations of those authorizations. (b) Subject to any specific arrangement or agreement, the CF may share with a law enforcement agency classified information and intelligence in accordance with Reference K, under limited circumstances. Questions on intelligence sharing should be directed to the CF functional authority, the Chief of Defence Intelligence.